My grand baby is is really enjoying the swing set. It is stronger than I thought because of her weight but it works perfectly for her age. She’s four years old it should work for up to age six or seven years old. Bring active fun to playtime with this Sportspower swing set. 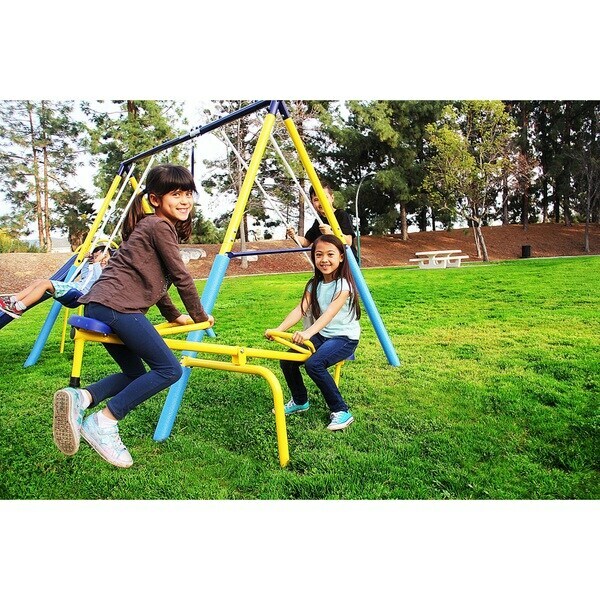 The sturdy metal design can accommodate up to six kids with two swings, a trapeze, a teeter-totter, and a wave slide. The set's foam-padded legs improve safety. A little smaller than I would have liked. Perfect for my 4 year old but my 10 & 11 year olds are both too big for everything. I wanted them to at least be able to swing but their legs are too long. It was a birthday gift for my 4 year old and he loves it! It took me about 3 hours alone to put it together. Be sure to keep the parts in the plastic bags they're in until you're ready for that particular part. I took off the bags and didn't realize that's where the parts # was. Overall I wouldn't purchase again because of the size. The quality is basic . This is a very reasonable price for a small set and it doesn't take up a lot of space. For the price you can't beat this. Put it together myself in an afternoon and was fairly simple. Only problem was the blue caps to cover the bolts. Most of them broke off and too replace you have to take the bolt back out. and a lot don't fit over the bolts too. 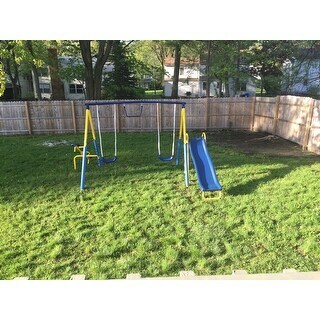 This is a basic swing set but kids love it. The shipping was fast and all the pieces and screws were all there. The only thing I don't really like is the teeter totter is not very sturdy and is wobbly. Other than that this was a good addition to our backyard. Love this swing set. My grandbaby could play on it all day if I would let her. Easy to assemble. Just need time a drink and a snack. Was looking around for a swing set online and found that Overstock has some really good deals. Decided to purchase this because it fit the area in my backyard. Turned out exactly what I was looking for and the kids absolutely love it. Installation was straight forward, so there's nothing you can really complain about for the price. Awesome swing set!! Easy to assemble and the grandkids love it!! Great products for the money. Easy to assemble. Was described accurately on overstock. The perfect size Delivered right to my back porch.I really love the ease of shopping from home. Instead of driving all over to find what you need. Held up great thru winter.nice set! "What is the recommended weight limit for swings? For teeter totter?" The recommended weight limit is 200 lbs. "Are the swings interchangeable? For example, could I replace one of the included swings with a baby swing?" "Do you recommend cementing the legs in the ground to ensure sturdiness?" "What are the dimensions of the whole set? " The assembled dimensions of the whole swing set is 134"L x 100"W x 73.6"H.
"Would this set work for up to 10 years of age?" The recommended age for this set is about 3 to 8 years. "Is the slide metal or plastic?" "What is the weight limit on this swing set?"